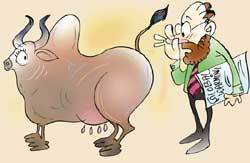 Bringing down cow flatulence can reduce the presence of greenhouse gases. So believe a group of scientists from New Zealand and Australia, currently working on a multi-million dollar research project. Their project is based on studies that have established that methane, a major greenhouse gas, from cows is responsible for global warming. A US study, too, estimates that 9 to 12 per cent of energy consumed by cows is converted to methane that is released through flatulence or burping. The project, funded by the Australia-New Zealand Biotechnology Partnership Fund, aims to "breed more efficient cows that convert their food into more milk and less methane". Earlier, in 2003, the New Zealand government tried to impose a methane tax on farmers because their livestock was responsible for more than half the country's greenhouse gas emissions. But the so-called "fart tax" was dropped after protests from farmers.